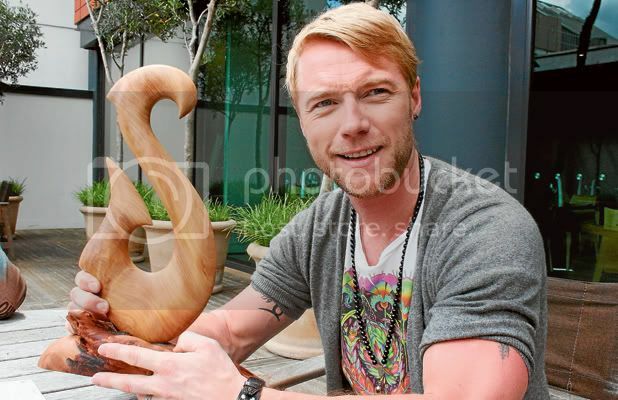 NEW ZEALAND SYMBOL: One icon meets another when international pop star Ronan Keating was presented with a carving sculpted from kauri wood. The house of international Irish pop singer and Boyzone band member Ronan Keating will have a little bit of Kaipara culture on display after being presented with a kauri carving. Keating was in New Zealand doing a concert at the Villa Maria Estate Winery in south Auckland on Sunday and before that at the Mud House Winery and Cafe in Napier. Dargaville & Districts News interviewed Keating at the SkyCity Grand Hotel in Auckland on Sunday. Keating says he enjoys being in New Zealand and Australia and looks forward to continuing a good relationship with people Down Under. "I love coming back and how people look after us here," he says. He came for a short visit to New Zealand last April where he performed at the Dancing With The Stars finale and toured about seven years ago after splitting with Boyzone in 1999. The carving of a large wooden fish hook, sculpted from 4000-year-old swamp kauri, was presented to him as a gift from the people of the Kaipara by Dargaville & Districts News. The fish hook depicts the Maori legend of how New Zealand was discovered by being fished up out of the sea. It was made by Dargaville carver-sculptor Mario Marinkovich and donated by Nelson Parker, of Nelson's Kaihu Kauri, where Mr Marinkovich also works. When Keating opened the gift, he was a little puzzled. "This is lovely, but what is it?" he said. This is not the first time he has brushed with New Zealand Maori culture. He pulled up his shirt sleeve to briefly expose some Maori symbols on his upper arm. However, they were not to the extent of English popstar Robbie Williams - formerly of boy band Take That - friendly rivals of Keating and Boyzone. Williams got a large Maori tattoo on his arm while visiting New Zealand years ago. building a new home in Ireland. Keating started out in a school rock band called Namaste which means hello in Fijian-Indian culture. "I think we got our name from a track from a Beastie Boys album," he says. Keating says his daughter Missy, 9, looks set to be the only one following in her father's footsteps into the music business. "My 11-year-old son would rather be playing football." That it great, thank you! Some beautiful photos from Yarra Valley taken by Sue now in the RKN gallery. I found this link via Libby's blog post on his current tour. Some lovely photos! !